Last week and this week, our district is administering our first benchmark assessment of the year in reading and math, and for 5th grade, science also. That means 12+ hours of instruction both weeks is lost to testing! As a teacher who works with ELLs, I am more cognizant than most about the cultural lens needed to succeed on the test. Some of the reading tests had stories about smoothies or baseball- things that my students may not be familiar with because they are not part of the culture that my kids have grown up with or were born into. Today, as I was administering the math portion of the test, the students kept stumbling on the names used in the word problems. For one thing, they couldn't read them. They also couldn't recognize them as names, rather than part of the problem that they were to solve. Names like "Althea" and "Justine" simply aren't common to these kids. In another instance, one money problem had a pile of pennies. Some were face up, some were tails up. The students couldn't distinguish that the tails-up pennies were still pennies. Another money problem only showed part of a $1 bill, and the students couldn't identify those as still being $1 bills. I was a little amazed, but then I realized: 90% of students at my school are on free or reduced lunch. Some of them might never have had their own coins or bills, or actually used cash to pay for something. Many parents don't carry cash now and simply use the debit card. It would really not surprise me if some of these children had not actually held real cash. Are these tests accurately assessing the students' ability to use the skills we're teaching? It doesn't really seem like a valid measure to me if the students have to have a certain cultural perspective to succeed on the test. And the problem doesn't just stop with my ESOL students, it extends to many mainstream students as well, especially those of lower socioeconomic status (SES). In the school that I currently teach in, we are a Title 1 school with a very high percentage of free and reduced lunch students. These students do not come from families where education is a priority. Many students must take care of younger siblings instead of doing homework because the parents are working in the evening. Many parents do not spend money on books for their children, so the children do not have books to read at home. Their parents cannot take them to the library in the evening because they are working. These students do not have the same opportunities to go out into the world on a regular basis and do things that students of higher SES get to do- even things that we take for granted like going to the grocery store, out to eat, or to see a movie. These real-world experiences help shape our culture, our schema, and our world view. Understanding a story about baseball, or knowing that pennies have two sides that look different, or each bill we use as currency has a different president on it, are all things that come best from real-world experiences, like playing baseball or buying something- not classroom learning. So where am I going with this? How can we get valid assessments that test our students' abilities rather than their cultural perspective? How can we bridge the culture and SES gap to help students become successful? As a teacher, it has to start in the classroom. I believe that we need to provide more authentic, real-world opportunities for students to practice the skills they are learning. I know that with all the other demands and paperwork, you're probably thinking "Yeah, let me hop right to adding something ELSE to do to my already long list,". Real world connections don't have to be big- just relevant or engaging for students. I was one of those kids that always thought, "How am I going to use this in the real world?" Unless we can show students how these skill are valuable, they have no motivation to learn and internalize them. If students are learning about elapsed time, have them write a schedule for their day (or their day in the profession of their choice) following set instructions. If students are learning about money, get some realistic looking money and create an activity that puts the money into context- like Christmas shopping with catalogs and sticking to a budget. It is easy to get discouraged because we can't stop the testing tide- and in some districts, teachers' salaries and jobs depend heavily on their students' test scores. But, we can change how we do things in our own classrooms to help our students bridge these gaps. Consider having a once or twice monthly lab day where students have the opportunity to apply the knowledge and skills they've learned to real-world situations. 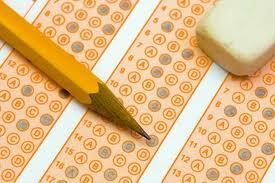 Have you noticed a cultural or SES bias in state or district tests? I'd love to hear your thoughts! We have the same problems with testing in our school. Imagine teaching abroad where none of the students are native speakers. Skills need to be applied to help towards understanding assessment skills and especially vocabulary. It is always a learning process for the teachers as well as the students. It is nice to know someone else understands the problems these students are facing. I teach ESL in a middle school; and I have a similar situation as the one you mentioned above. Many of my students can't get the homework done at school and have huge families so they are most likely babysitting or helping out at home. Newcomers do not have to take the Reading portion of our standardized tests , but they have to take Math and Science, which, duh!, has alot of reading! It doesn't make sense, and it is going to get worse once test scores are tied to teacher evaluations. Many teachers already have a negative view of having an ESL student in their class because they don't want their scores to go down. That is not helping the student at all! So, not a good scenario, but I try to give them many opportunities to show their learning in my class and I am constantly educating the teachers to do so as well. When I come up with the magic solution I will pass it around!